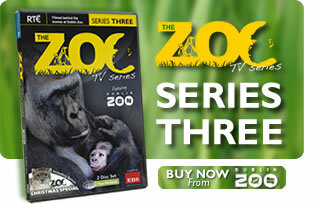 Zookeeper Brendan fulfils a lifelong ambition when he encounters a band of Mountain Gorillas on his journey into the heart of Bwindi Impenetrable National Park in Uganda. After months of hand rearing Helen and the other keepers have become very close to Kasi the baby mangabey and she has gone from strength to strength under their care. Finally, the big day has arrived and it’s time for the mangabey and her keepers to part ways. We join the little monkey as she prepares to be rejoin the rest of her troop on Mangabey Island for the first time. There’s great excitement in the West section where Ciaran and Gerry are keeping a close eye on Dublin Zoo’s snow leopard pair. Mating season has just begun for these beautiful but critically endangered cats, and it’s so far so good as they seem to be showing a lot of interest in each other. Red panda babies grow up fast as their keeper Susan knows only too well. The two youngsters are already proving quite the handful and are becoming more curious and playful by the day. Susan visits them in their habitat to give them a check-up and see how they are getting on.